The French-foreign film Amour, written and directed by Michael Haneke tells the tale of two retired music teachers, Georges (Jean-Louis Trintignant)and Anne (Emmanuelle Riva). The couple, who are in their 80s, start out the film with passion and an enduring love only to be reduced to the inevitable loneliness of suffering and loss by the end. When Anne suffers a stroke, Georges takes it upon himself to care for her with only a part-time nurse. He makes her a promise never to take her back to the hospital and consequently forces his patience and tolerance to be severely tested. 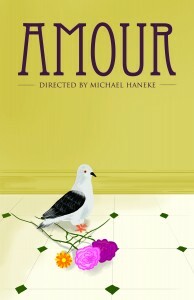 Amour is about much more than love as it explores themes of euthanasia, loss, illness and family. While the pace can be slow-moving and mundane, the realistic depiction of the daily routine necessary in caring for an ill relative creates an emotionally tragic reaction. The beauty of Amour is its rejection of its own cinematic form in which the setting never extends beyond the couple’s apartment and there is no soundtrack or musical accompaniment to foreshadow dramatic events.The lack of traditional movie elements contribute to its realness and the ever-present silence artfully functions as a metaphor for the lonely life Georges is forced to live. With its vivid realness and superb acting it is no wonder Amour is nominated for five Academy Awards. The only negative for me was the onslaught of depression which left me to question, what is the point of life?